This graphic illustrate the true cost of livestock production - from extensive water use to greenhouse gas emissions - as a major threat to endangered species and the planet. The Meatstinction! infographic was created as part of the Center for Biological Diversity’s Take Extinction Off Your Plate campaign to illustrate the true cost of livestock production - from extensive water use to greenhouse gas emissions - as a major threat to endangered species and the planet. The message of “Eat less meat. 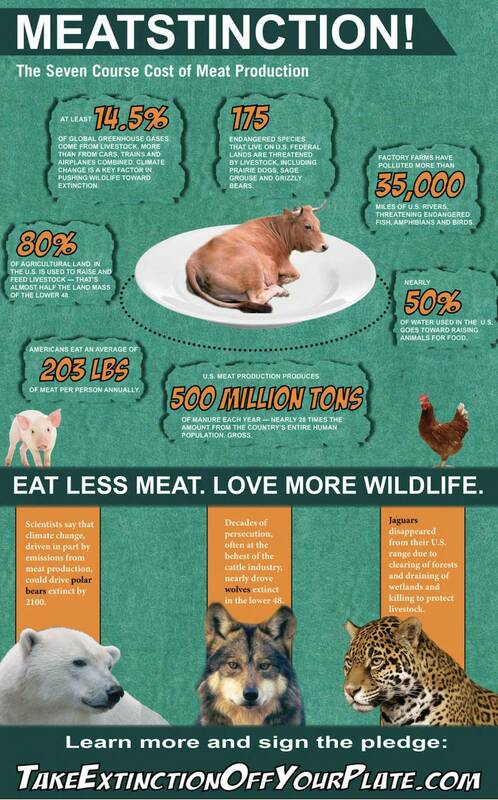 Love more wildlife.” highlights the positive effects of choosing to reduce meat consumption. Meat production is one of the main drivers of environmental degradation and species endangerment worldwide. Yet most people don’t realize that reducing their meat consumption can be one of the most powerful ways to reduce their environmental footprint. The Take Extinction Off Your Plate campaign was launched as part of the Center’s Population and Sustainability program to raise awareness about the devastation to wildlife and the environment caused by the meat industry and to encourage people to help save wildlife by eating less or no meat. The objective of Take Extinction Off Your Plate is to bring attention to livestock production as one of the greatest threats to wildlife and the planet, and to urge people to reduce their meat consumption. The campaign uses creative media, outreach and opportunities for action to engage people in the conversation about meat production and support their efforts to transition to an Earth-friendlier diet. In the first month of the campaign, more than 14,000 people signed a pledge to reduce their meat consumption by one-third or more, which would have the collective impact after one year of saving billions of gallons of water, thousands of acres of land and the greenhouse gas equivalent of taking more than 4,000 cars off the road for a year.